YOUNGSTOWN — Jaynee Corbett looked around the WATTS. No wooden platform below her,or even her wide variety of music blaring through the indoor track and field facility. There were more people invading her space, more than just her sprinter teammates around the track. 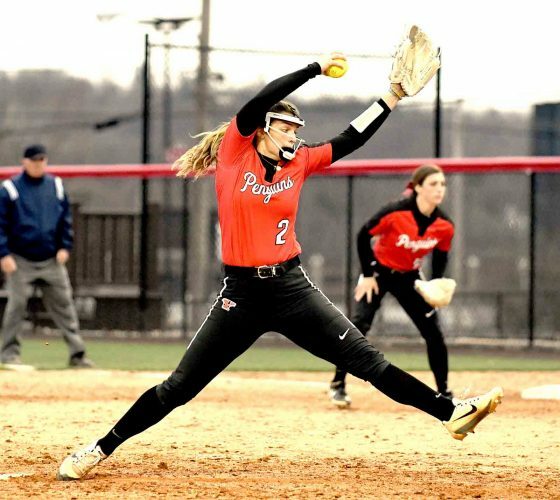 But, there’s no place she’d have rather been on Sunday as she capped her indoor career by capturing the shot put and weight throw — dominating both events by a couple of meters — in the Horizon League Indoor Track and Field Championships. For her accomplishment, she was named for the second time the Alfreeda Goff Female Athlete of the Year in the league. 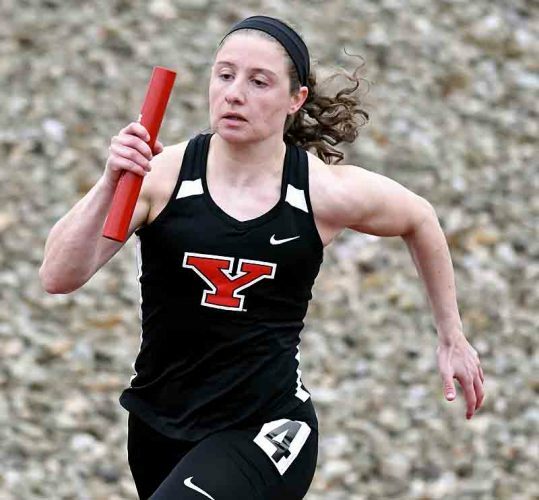 Corbett led the Penguin women to the team’s fourth title in five years as YSU distanced itself from Milwaukee, 201-162.5. She said she was caught off guard Saturday after winning the weight throw, but said after taking Sunday’s shot put she was bit more composed. Corbett couldn’t say the same as she hoisted the Horizon League trophy once again. John F. Kennedy graduate Chad Zallow, who won the Alfreeda Goff Male Athlete of the Year for the third straight season, said he was mentally and physically spent after two grueling days of events. He won the 60-meter hurdles and 60 dash, but had one more event — the 200. He knew his team needed points to capture a third straight title. “You’re body is running on fumes,” said Zallow, whose YSU team handled second-place Oakland, 203.83-121. “I know my team needed the points coming in. At that point, I had to run for my team. The inspiration for the men’s win came from Girard graduate Collin Harden. He was ranked around fourth or fifth when he produced a personal best time of 47.64 seconds. He came across the line and collapsed. 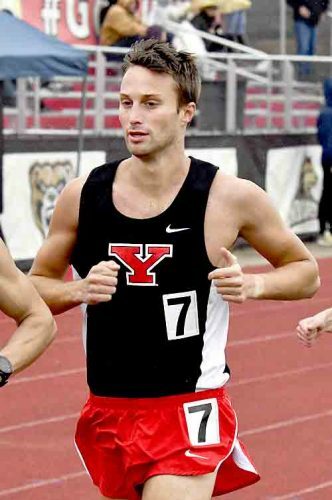 Eventually he was tended to by medical personnel in the infield as YSU President Jim Tressel looked on. Jaliyah Elliott, who was part of the winning 4×400-meter relay and won the 60, said there was one focus for the women’s team today. Coach Brian Gorby is quick to say the rest of his staff is to be credited with both wins. He said the teams will take a couple days to celebrate, but knows full well this is never a given. “It’s a tradition and we’re trying to keep it up,” said Gorby, who was named men’s and women’s Horizon League Coach of the Year. 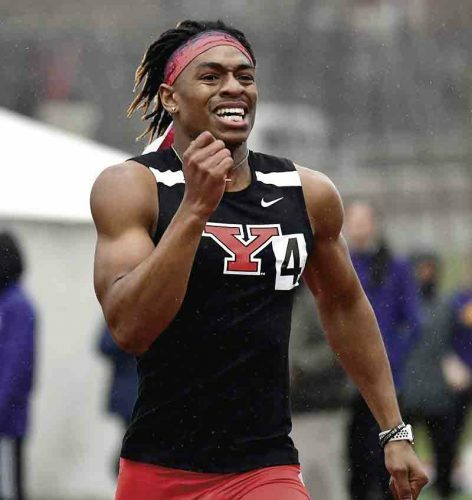 As Zallow looks around and sees his older brother Carl, who took second in the 60 and third in the 200, he knows he was part of the foundation of this YSU program.